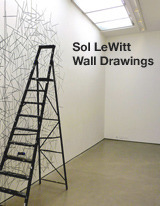 The Sol LeWitt Wall Drawings Catalogue Raisonné will be the definitive list of LeWitt’s most celebrated body of work and will include several newly discovered wall drawings as well as previously unpublished installation histories, photography, and multimedia. The catalogue features complete caption information for LeWitt’s approximately 1,350 wall drawings, as well as current collection information, complete installation histories, and selected bibliographies. Nearly every first installation of each wall drawing is illustrated with an archival photograph and additional images illustrate subsequent installations whenever possible—approximately 6,000 images in total. Select entries feature rarely-seen installation videos, and in one case, an audio file of LeWitt delivering installation instructions via telephone for the exhibition Art By Telephone at the Museum of Contemporary Art Chicago in 1969. Detailed notes by the editorial team highlight the evolution of many wall drawings and call out important distinctions from one installation to the next. The catalogue includes images of the wall drawing diagrams, schematics that indicate how a work is to be installed, and these images may be viewed on a single page alongside photography of the installations themselves. The Sol LeWitt Catalogue Raisonné research team is eager to receive any information or documents pertaining to the artist’s wall drawings. Any and all anecdotes about the installation, exhibition, or ownership of these works, as well as bibliographical references and visual material are also welcome. All information will be kept strictly confidential, and all photographic prints will be returned upon request.